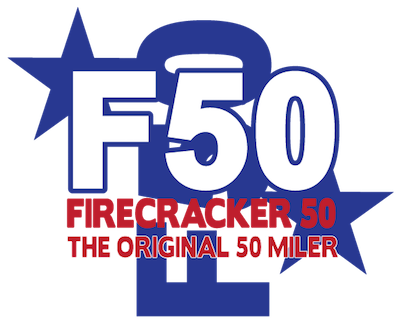 FIRECRACKER 50 | Maverick Sports Promotions - Where the athlete is first! Chose the wrong category? No problem, click HERE for the Category Change Request Form! MINIMUM AGE is 12 years old on Race Day. Racers 12-15 years of age may only race as part of a Team. Minimum age for Solo racers is 16. Race Solo or on a two-person Team Relay! 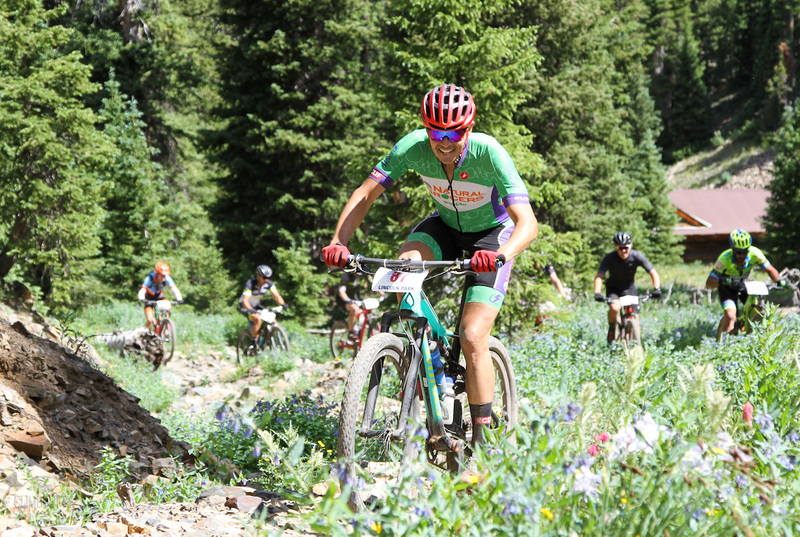 Solo racers ride the 25 mile loop twice! You are a Pro if you race for money, have a contract with a team, your bike was given to you by a manufacturer, OR YOU SIMPLY WANNA PLAY WITH THE BIG BOYS AND GIRLS!! You are an Expert if you’ve been riding for years…as in many years…like 10+ years AND/OR you’ve been racing for a few years. Some of you may have only been riding for a few years yet you jumped right into the racing scene. If that’s you, you shave your legs, don’t own any baggy shorts (or own mostly spandex), don’t consider it a “real ride” when you do wear baggy shorts, race for a team, and/or think about your riding, nutrition and weight (of both your body and bike) pretty much all the time, then you are probably Expert. In short, you are a stud but Pro is a bridge too far! Does this need to be explained? Singlespeed cycling is its own sport! Hopefully you’ll show up in cut-off Dickies, flannel shirt cut-off at the shoulder, an AC/DC T Shirt underneath, Lamb Chop sideburns and Fu Man Chu ‘stache! That’s the guys of course! Ladies are welcome no matter the attire! What is a Sport racer? Ahhh, the subject of many a group ride and coffee clutch! To quote my little buddy Evan, “if you have to ask what category you should be in you are probably Sport”! Sport racers are Lady and Gentleman Racers, the true essence of mountain biking. Sport racers have full-time jobs, families and obligations that take priority over training full-time. I know many of you Experts out there are saying, “Wait that’s me!”. Remember, the length of time you’ve been riding/racing really determines your ability. Sport racers have only just started racing…many have only just started riding. Sport racers may, or may not, shave their legs. 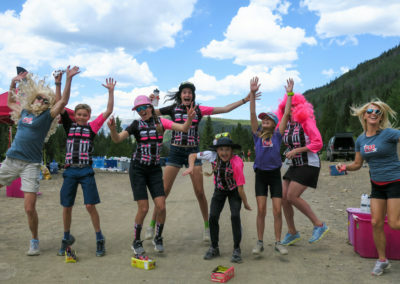 Sport racers enjoy riding with friends, in baggy shorts, and stopping to enjoy the views. Sport racers may have a team affiliation but may not even know what that means! Here’s a good one…if you race Sport and are in the top third of the results I can pretty much predict that you would be top half in the Expert category for your age. Ya know what that makes you? Yup…you guessed it… A SANDBAGGER! Choose well my friends! These classes race as a 2 person team, each teammate rides one lap each, relay format, on the 25 mile loop. Only one number plate will be distributed per team. Therefore the number plate must be transferred from Lap 1 rider’s bike to Lap 2 rider’s bike in the transition area. Team 101+ Duo Relay-ages of teammates must add up to a minimum of 101 years. There are no gender distinctions in this category. Team 110+ Duo Relay-Ages must add up to a minimum of 110 years. There are no gender distinctions in this category. The smart play is to be on a Team IF you want part of your 4th of July for other activities…such as…watching the kids while your other half races, getting to a BBQ hosted by friends, or you just don’t wanna be all blown up at the end of the day!One thing’s for sure…If there’s even a remote doubt in your mind that you can’t finish the 50 solo then seriously consider forming a team! You will start in a different wave than Duo Male Team Relay. Just clarifying that if you are in Team 101 or Team 110 and are two men, please line up at the Team 101 and Team 110 staging signs. DO NOT START with Duo Male Team Relay. Yup, you read that correctly. Only one number plate is issued to your team. That means you must transfer your number plate from one bike to another in the transition area. We’ve seen some very cool and creative solutions to this and it was fun to watch. Please make sure the number plate is mounted on the correct bike for Lap 1! This also prevents riders from leaving the transition area early…cheaters! Click this Bike Reg logo to be directed to the online registration page! Online Registration closes on July 2 at 6:00pm. Fees: Reduced pricing until March 15. 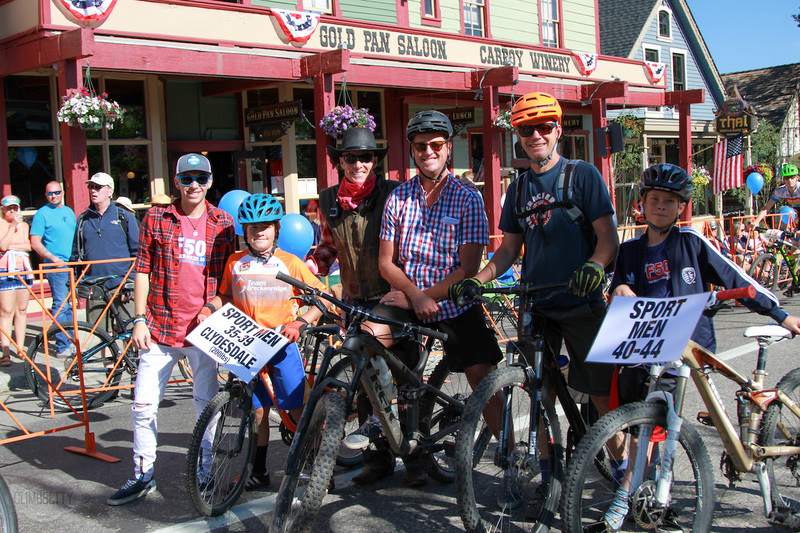 One of the most premier MTB experiences in the country complete with starting the 4th of July Parade!! Athlete Gift, usually a T-Shirt, we may change it up this year! We give refunds through Thursday June 29 at 11:59pm Mountain Time…no questions asked, no doctor note needed! This gives folks on the Wait List (if one gets generated), time to make arrangements and be here on race day! Why so lenient? Because we don’t believe you should have to pay for something you don’t receive! And applying the entry to next year’s race MIGHT work for you… but who knows what the heck you’ll be doing a year from now? We’re told this approach is unique in the event management world…we’re not trying to set any records! We’re just trying to do the sensible thing and be fair! CLICK HERE to access the Refund Request Form! You may pick up for others! How’s that for service?! Duo Team Relay Teammates may pick up for each other. One caveat…you are assuming responsibility for getting correct shirt and sock size! Want to take all the guess work out of parking? Then park at the Satellite Lot for GUARANTEED PARKING. Ride your bike into town (a couple of miles) with everything you need for the day including post race. Check your bag at our FREE valet service. Then, after your race you can check your bike too. We will provide security for you until awards are completed at approximately 4:45. Read further for other parking options but please recognize it is a huge day in Breckenridge and the load on parking is significant. We love our town and this is our way of lessening impact on July 4th! On street parking is PROHIBITED. Directions here are to get you to Packet Pickup and for reference. The other Parking Options are detailed below. From I-70 take Exit 203. Go past 7-11 and move into Left Hand Lane. Go through Roundabout continuing south on Main St.
Take first left at traffic light onto French St.
Go two blocks and turn right onto High St. 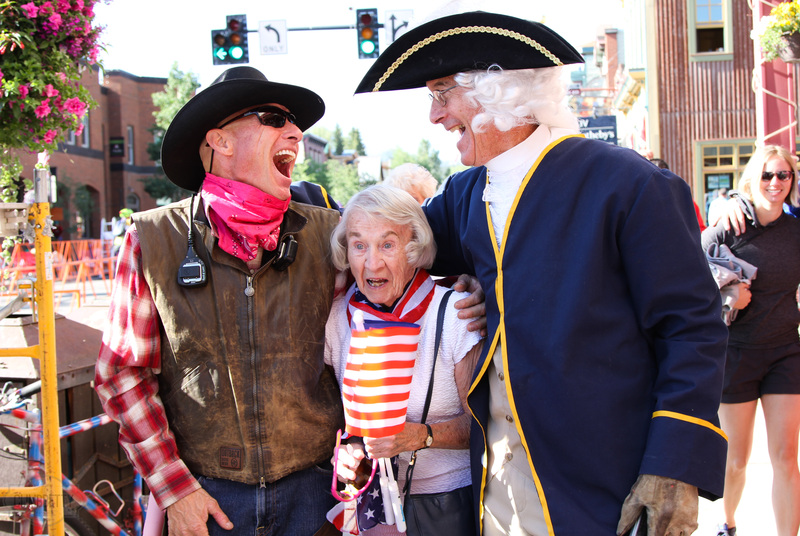 The 4th of July is a huge day in Breckenridge. If you are staying in lodging please consider leaving your vehicle there and riding to Carter Park for packet pickup! If you need a place to park, there are many parking options! Click Here for a Town of Breck Parking Map! Park here, ride into town with a bag containing all you need for the day and use our complimentary Bike and Bag Valet Service. The Satellite Lot is GUARANTEED PARKING. 3.French St. Lot-Using directions above, immediately after crossing Lincoln Ave, make left into French St. Lot. 4. Carter Park-See directions above, limited space here. 5. Breckenridge Elementary School-Using directions above, after crossing Lincoln Ave, go straight at Washington and Adams Ave and take next left onto Jefferson Ave. This puts you directly into the Elementary school lot. Carter Park Pavilion is a short walk across the playground. 6. Klack Placer Lot-using directions above, after crossing Lincoln Ave go straight at Washington and Adams Ave, straight at Jefferson Ave and park in the next lot on your left. This puts you adjacent to Carter Park Little League Field and there’s a gate in the fence. Walk/Ride a short distance to the south of the ball field toward the Pavilion. 7. Breckenridge Grand Vacations Community Center 103 S. Harris St-Using directions above, at Washington Ave, turn left. Community Center is a large brick building on your left. There is parking on both the north and south sides of the building. Walk or ride to Carter Park. A FREE service designed to give you peace of mind, ease of logistics, and to lessen impacts on parking! Behind the Carter Park Pavilion is a baseball field. There you will find a secure area to check your Bag/Bike for FREE. If I were racing here’s what I’d do on the AM of the Race. Park at the Satellite Lot. Ride into town (a couple of miles) with everything I need for the day including post race. Check your bag at our FREE valet service. Then, after your race you can check your bike too. We will provide security for you until awards are completed at approximately 4:45. Ever been in a 4th of July Parade? If not get ready for what some call the best way to start a race. The Start Line is at Lincoln and Main St., the main Traffic Light in town. This is important! If you are trying to access the start by coming north on Main St after we have started sending waves YOU WILL BE RIDING AGAINST RACER TRAFFIC. Thank you for your cooperation! Timing is started for each wave when the group rolls so the neutral start is included in your time. Teammates in the Duo Team Relay categories may share this part of the race together…Lap 2 rider pulls off to the side with the marshal/leader. The race will begin in a neutral start format by start wave (see waves below). Each wave will have its own marshal/leader that will roll at 10MPH. At the south end of Main St. the race moves to a width of one lane and the yellow line rule is in effect. Please DO NOT PASS your marshal until they pull out of the way. This will happen at South Park Ave. and the race is on! That means you must transfer your number plate from one bike to another in the transition area. Make sure the number plate is mounted on the correct bike for Lap 1! This also prevents riders from leaving the transition area early…cheaters! Lap 1 riders, since you actually finish first on the day, please consider using our Complimentary and Secure Bike Valet service. Check a bag in the AM and it will be waiting for you when you finish. Check your bike, then check your bag again and hang out worry free for the afternoon. No need to keep one eye on your stuff while consuming mass quantities and waiting for your partner to finish! You will start in a different wave than Duo Male Team Relay. Just clarifying that if you are in Team 101 or Team 110 and are two men, please line up at the Team 101 and Team 110 staging signs. DO NOT START with Duo Male Team Relay…kinda messes up the results and makes me have to put on my official’s hat…yuck! Come see what the local mountain goats ride every day. Each lap has 4000′ of climbing. The first 6 miles of that is on the climb out of Breckenridge on the old narrow gauge Railroad grade. The race starts the 4th of July Parade in a neutral start format by start wave. From there the odyssey sends you into the Backcountry. There are a couple of grunty little climbs, a couple of long lungbusters, some absolutely rippin’ descents and plenty of contouring flume and singletrack. Take my word for it, the course is a full-on MTB course. It has it all and it’s no gimme! 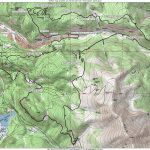 The Course Description references the “Breckenridge and Summit County Hiking and Biking Trail Map”. This map is available at most bike shops and the Visitors Center, 203 S. Main St., for $15. 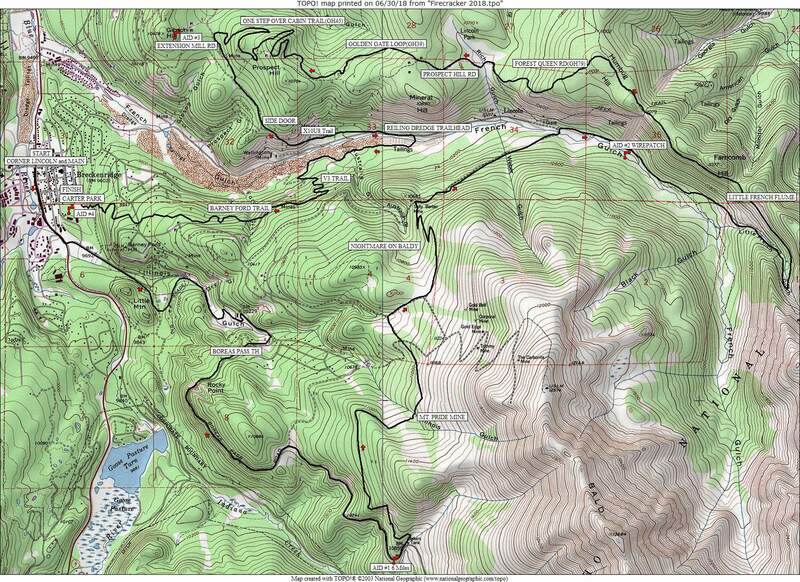 Proceeds from the sale of this map support Open Space and Trails! BIG THANKS TO OUR AID STATION SPONSORS LISTED BELOW. THESE LOCALLY OWNED BIKE SHOPS SUPPORT THE LOCAL CYCLING SCENE IN A HUGE WAY. PLEASE CONSIDER THEM FOR ANY BIKE RELATED NEEDS!!! 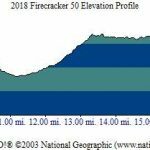 AID STATION #1 at Bakers Tank, Milepoint 5.4, is sponsored by Avalanche Sports, 2 locations, South Store 540 S. Main St next to Breckenridge Brewery and Blue Moose Restaurant 970-453-1461. Our slogan is “you can go long and you can go light”. Most racers do not carry a hydration pack for this race. There are 4 Aid Stations per lap. Check the map for locations. We’ll have an army of volunteers out there doing hand-ups. For info on personal items read below*. Aid Stations will be stocked with Skratch Lab Energy Drink and Water in bottles that will fit in cages. There is a Port-o-let at each Aid Station on course AND one next to the Team Staging area in Carter Park. *To those of you who have given us feedback on having more variety at the Aid Stations this is for you! We truly appreciate the comments. It’s just not possible for us to predict the likes and dislikes of several hundred people. 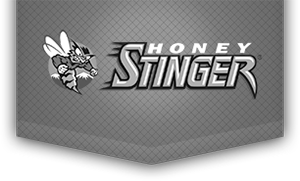 Therefore we continue to support you with Honey Stinger energy products, water and energy drink. We’ll gladly get the stuff out there for you and bring it back to Carter Park at the end of the day (approx. 4:00pm). You are responsible for finding your own stuff at the Aid Stations! We’ll have the personal items set aside from the neutral stuff to make it easier for you to find your items. A big deal! Here’s what we’ll do for you to make it easier NOT to litter in the backcountry…we’ll place a garbage can 100 yards or so past each Aid Station. There will be a sign that reads “END FEED ZONE”. If you can’t, or don’t wish to, unload items by this point then PLEASE hang onto it until the next aid station…it’s really not that far away. Get the trash in, or near, the container and we’ll take care of the rest. It is completely inexcusable to intentionally leave your wrappers and bottles out there! We realize there is a requisite amount of post-race cleanup that is our responsibility. There’s an aid station every 6 miles. If you can’t discard your trash at the garbage cans then please hang onto it until the next aid station. Thanks for your cooperation in advance! We have a team of 7 on-course EMT’s. We also have an EMT crew in Carter Park. If you encounter a medical situation, please follow this protocol. First rider stays with injured racer. Second rider goes along course for help. We have marshals with radios along the route with staff at the bottom of sections that are the most technical. If necessary, you may call 911. If you call 911 please identify yourself as being affiliated with the Firecracker 50. That will intiate direct contact from Summit County Dispatch to our Lead EMT. I may be crazy but here’s my cell number too! 970-390-4760. There will be mileage markers in Yellow Duct Tape on many of the arrows. If reporting an incident please give a mileage location so that we can identify the location and respond as quickly as possible. If you see a wreck, but don’t know for sure the extent of any possible injuries, then don’t report the incident. Leave that to the next person or group. We want to avoid False Alarms. People who send for help should know for sure that help is needed. Please be prepared to provide Gender, Age, and Nature of injury. If someone had told me back in 2001 that the Firecracker would be as popular as it is now I never would have believed it! People ask what makes it so unique and it has become clear that it is a combination of things. 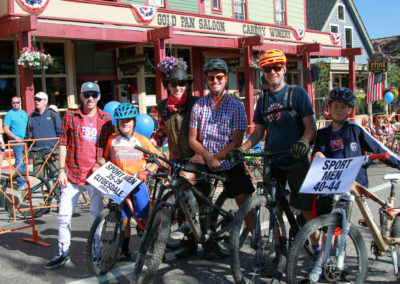 The Aid Stations and the enthusiastic volunteers, the Main St Parade Start, the Wild Turkey Challenge, Little French Gulch, the Woolie Boolies, and the fact that it is on July 4th all contribute. And from my perspective it is you, The Racers, that make it super special! Whatever your reason for competing we are honored to have you. Over the years, the Firecracker has donated several thousand dollars to local non-profits. That tradition continues! 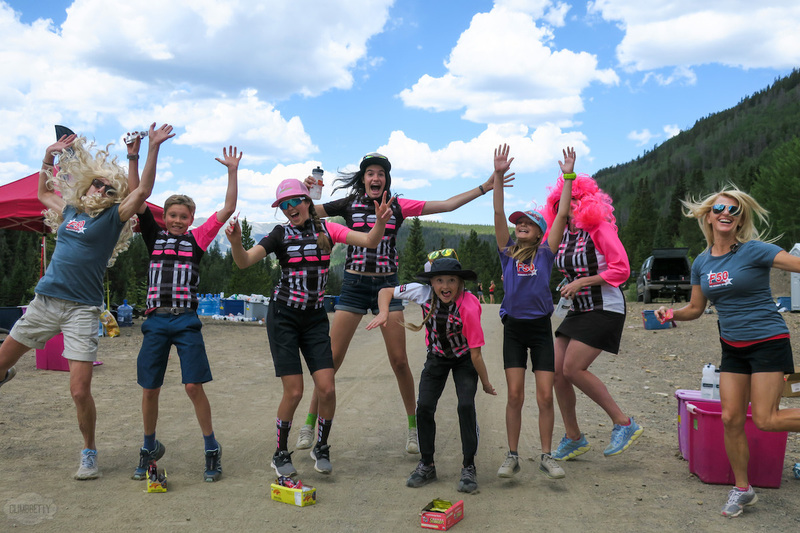 So…welcome to the Firecracker 50, welcome to Breckenridge, welcome to our backyard! Click HERE to access our Change form! You may also use this to request a refund! Awards for the Pro/Open Men and Women will be presented at approximately 3:00. Awards for all other categories will be presented at 4:00. Are you interested in helping out at this year’s race? We’d love to have your help. We ask for a minimum 3 hour commitment and you’ll receive an Event T Shirt, Event Socks, Post Race BBQ, and Party. We do have positions available on July 1, 2, 3, and 5 if that works better for you. Great Western Lodging is the official lodging partner of the Firecracker 50. 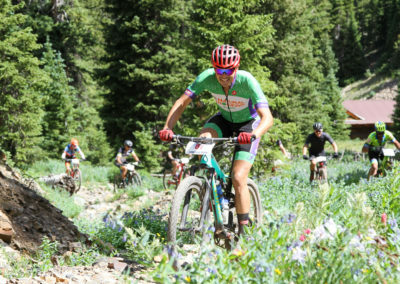 Jeff and Chad are avid cyclists and Great Western sponsors the Firecracker, a Mountain Bike Junior League Team in the local Summit Mt. Challenge Series, and they sponsor race #6 in that series, the Peaks Trail Time Trial. Due to the long holiday weekend, a three night minimum is required. Come on up with friends or family and enjoy our town all weekend. Great Western Lodging offers condo and private home rental. Please inquire about the possibility of a late check-out. Click Here or call 888-333-4535. Use Promotional Code BIKE16 to save an additional $50 off of your lodging. Camping within Town of Breck limits is not available. There is a ton of US Forest Service land surrounding Breck. Have at it! In the interests of safety, a time limit will be imposed. The cut-off location is Aid Station #2 on Lap 2. This is Mile 36.5 and the cut-off time is 3:15PM. For a racer starting at 9:59 this allows them 5 hours or an average speed of 7.3mph. Projected over the 50 mile course, 7.3mph equates to a total time of 7:08. We feel this is a more than reasonable rate of speed for Sport racers and allows faster racers time to deal with mechanical issues and still make the cut-off. Any racer arriving at Aid #2 after 3:15 will be directed downhill on French Gulch Rd. to downtown Breckenridge with a cold beer in hand! 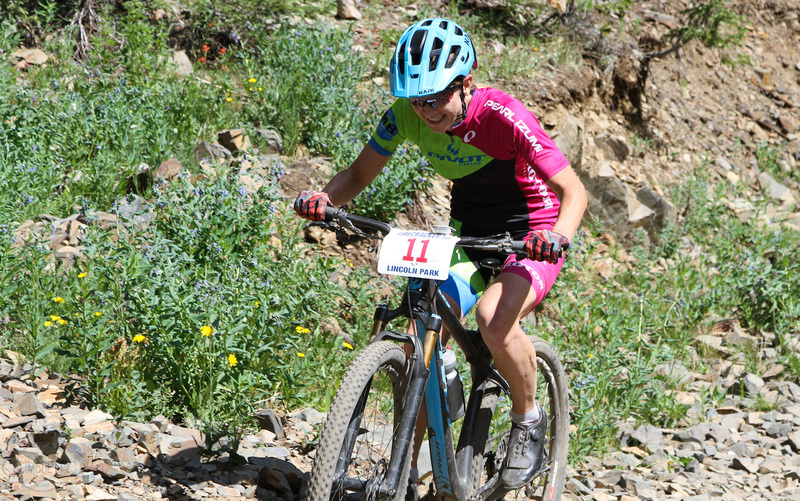 Annie Emich Black was racing in The Fall Classic in 2012. 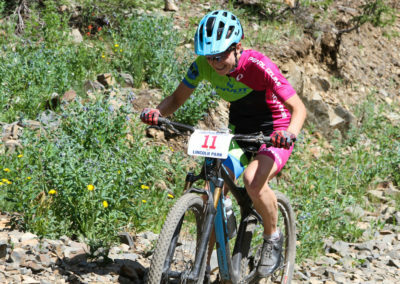 She was on a narrow piece of singletrack when a racer attempting to pass took her out. Annie never raced her mountain bike again. Fortunately, despite a serious injury, she is able to ride again(quite well I might add). Last year in the Firecracker 50 Ted Gould, a veteran with 25 years racing experience, was about to enter Nightmare on Baldy. He was taken out by a racer attempting to pass. Ted blew up his shoulder. Like Annie, Ted has almost made a full recovery and can enjoy mountain biking again. However, he has called it a career as a racer. Why am I sharing two stories that are kind of a bummer? Because both of these situations were totally avoidable. The answer is education…perhaps people just don’t know. So my hope is to make MTB racing more enjoyable for everyone by sharing some common sense rules of the road. This may be obvious to many, not so much to others. I’m calling it The Goulden Rule…or to be even more corny, The Black and Goulden Rule! 95% of the responsibility in a passing situation is on the person doing the Passing. Think skiing/riding. Downhill has the right of way. The same basic concept applies in mountain biking. The passing racer MUST NOT shove their way into space that is not there and therefore not theirs to take. You must watch for the rider ahead of you and pass cleanly. And please don’t tell me that “rubbing is racing”. I’m not talking about “rubbing”. Rubbing is just fine. I’m talking about full-on Space Invasion and people acting selfishly. Believe me, I get it. You’re pumped, you see an opportunity to pass and you go for it. In both Annie’s and Ted’s cases, the passing rider claims they announced their intention to pass. However, they did so when wheels were already overlapped and the rider being passed (Annie and Ted) had no warning. Now, this is okay if it’s a wide two-track and the person being passed is riding a predictable line. But to enter space that isn’t there to begin with and then say in an entitled fashion “On your left” doesn’t cut it. It doesn’t give the rider being passed the opportunity to brace themselves for a potential Rub. They have no control over the situation. You want to pass? Awesome! Let your presence be known, get an acknowledgement from the rider you’d like to pass and then WORK IT OUT between you. That means there must be two-way communication. Now for the rider being passed. You must not block. Blocking is when you intentionally prevent someone from passing. Here’s the deal. If someone is clearly faster than you, then you must yield the trail. But only if it’s in a place that is safe for you. Sometimes that means you both have to wait for a safe place for you, the person being passed, to pull over or for a wider section of trail for the Passer to come on by. Intentional blocking is poor sportsmanship. Let the person behind you go by and then the pressure is on them to make that pass stick. And if they can’t hold you off they’ll hopefully return the favor and let you by if/when you want to take the spot ahead. So again, WORK IT OUT between you. Communicate! And that brings me to my next point…listening to Music while racing. You want to listen to music? We won’t tell you not to because frankly it’s something I have no desire to enforce. But I will tell you this. If you can’t hear others that are trying to talk to you then do me a favor. Go ride alone somewhere instead of participating in my events. I realize that sounds snarky and I meant it that way. When you enter an event, especially a mass start event, you are in it with others. Communication is a two-way street. So how about this? You can play tunes as long as you can communicate with others and that means being able to hear…not just yell at people and expect them to clear the way for you. We’d prefer you wear only one ear bud AND keep the volume respectfully low to be able to hear others. As for the new trend of externally-mounted speakers? I could make a case that they solve the problem because you can listen to tunes AND hear others. But is it fair to impose your taste in music on others around you? I say no, it isn’t. In fact, if I were riding with a guy whose music I didn’t like, I’d call it Noise Pollution! I grew up in the era of Boom Boxes. Are we really going back to that? So, these set-ups are PROHIBITED! I hope that all makes sense and thanks for reading! It’s a great sport and we can all do our part to make it better by behaving courteously and in a sportsmanlike manner! We LOVE this race and respect the heck out of each and every one of you for lining up! All of us at Maverick Sports are present and/or former athletes so we get it!